A pianist doesn't give himself any presents when programming Mendelssohn, Beethoven, Chopin and Liszt in a virtually non-stop solo recital. 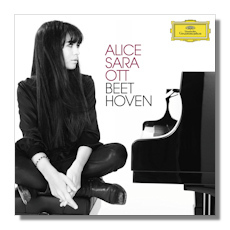 Of course, the formula may already have been well-tried for 22-year Alice Sara Ott and to a large extent with such a program she was browsing her still limited CD repertoire, yet bringing these composers back to back with some of their defining works remains nonetheless a daunting prospect by any standards. 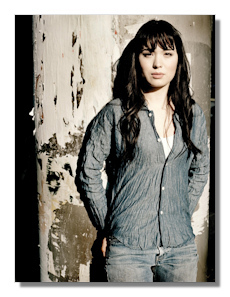 Still, Alice Sara Ott isn't the artist to avoid challenges. It seemed the shortest route to conquer the audience of the Baden-Baden Festspielhaus where she appeared for the first time. And conquer she did. Felix Mendelssohn's Variations sérieuses, Op. 54 immediately set the tone for this recital: the piece reminded us of Ott's jaw-dropping technique and stunningly precise piano touch, of her ravishingly luminous textures, and of her thoroughly musical approach boasting plenty of character, imagination as well as genuine joy at music making, allowing her to capture the varying moods of the variations with as much confidence as to caper nimbly from one composer to the next. By the textural clarity, enhanced by judicious pedaling, the rhythmical flexibility, moving from austere strictness in the Bach-like opening theme to appropriately delicate inflections in the cantabile and the more agitated variations, this Mendelssohn sounded attractively complete and left us begging for more. More came in the shape of Beethoven's Sonata #21 in C major, Op. 53 "Waldstein", which will be the main work on her upcoming CD for Deutsche Grammophon (4779291). Her rendition of the allegro con brio was full of energy, yet superbly limpid and leaving no detail hidden or dramatic effect omitted. The dialogue between the two hands was breathtaking during the development and several passages like the humming sound of the ostinati in the left hand duly hinted at Beethoven's modernity. The Introduzione, Adagio molto, however, may have been a bit too straightforward and lacking that feel of mystery and expectation which seems to pull you towards the following Rondo, but once there the movement gained a strong forward sweep, driven by Ott's dynamism and enlightened by her marvelous blending of the different voices. Beethoven's undulating and ever-differently textured runs were given with the right sense of gravitas or brightness, while the coda with its colossal trill was a marvel of clarity and tonal control. Since the concert was scheduled without an interval, Ott just left the stage for a few seconds in between programs, taking bows. It only took her an extra exit to switch from Beethoven to Chopin – less than some members of the audience needed in order to adjust to the vastly different sound worlds that separate these composers. She performed five waltzes (the three from Op. 34 and the first two from Op. 64) in an almost improvisational but utterly beguiling manner which made us hear these often played gems as if for the first time. There is nothing commonplace about these waltzes when molded by such imaginative phrasing and subtle rubato, and yet always performed with the right amount of stylistic and emotional control which keeps them from sounding merely wayward or eccentric. Ott seems to have a primarily melancholic, even somber view of Chopin's waltzes and there are moments you would want her to stay less long in the dark, but overall these prove totally fascinating experiences. Where did one ever hear such shyness and delicacy as in her poignant rendering of the A minor waltz? Or such faded brilliance as in the A Flat Major, while revealing unexpected colors in the left hand? Or again such nostalgic dreams as in the C Sharp minor? When her CD of the complete Chopin waltzes was released last year, some were disappointed, arguing that Ott's personal approach made them sound undanceable, while they were never intended for much action on the dance floor in the first place. In fact, she merely demonstrates Robert Schumann's remark about the Op. 34 that these Waltzes aren't dances for the body, but for the mind. The final part of the recital consisted of Etudes #9 (Ricordanza) and #10 (Allegro agitato molto) from Franz Liszt's Etudes d'exécution transcendante. While the recital left so far very little to desire, Alice Sara Ott really came unto familiar ground here, her private garden so to speak. Ott was merely 19 when she recorded the complete cycle for her Deutsche Grammophon CD debut and has made an unusual specialty of performing it in concert. That she didn't pick the most obvious barnstormers to end this recital, tells a lot about Ott as an artist. In fact, by the time she sat down to begin Liszt she had very little to prove anymore. The audience had long since surrendered by then. Still, her Liszt demands attention for never being a mere display of empty virtuosity. Both pieces were sparkling with light and color and it was great to hear that she revealed the lyricism in the Ricordanza with more freedom than in her CD recording. The Allegro agitato molto was very impressively played and brought with a finely judged buildup the recital to an exhilarating close. She gave two encores, a stunningly transparent La Campanella from Liszt's Grandes Etudes de Paganini and for contrast Beethoven's Für Elise, played with disarming simplicity and irresistible charm. She was more than generous in doing so. By then the Festspielhaus was up on its feet, cheering.